From the very outset of my blogging experiences, I have been interested in illustration and, specifically, in fashion illustration. As long ago as 2007, I commissioned Ian Mitchell, aka InkyMitch, to produce some more stylish images of eLle on Stiletto Wheels – that’s me, by the way – than it was possible to find from anywhere else. Of course, in real life, I look less stylish but, hey, if my alter ego in cyberspace isn’t entitled to a little artistic licence then what is the point of digitalising my life? 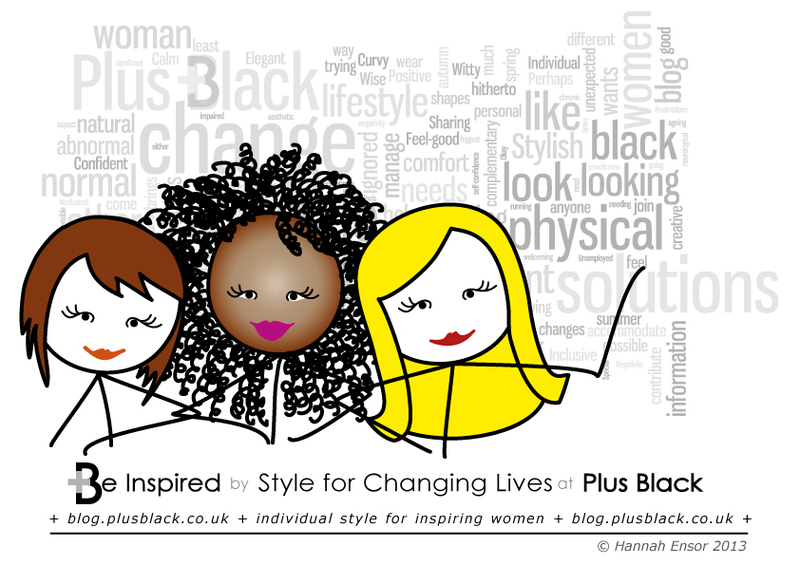 For the start-up of the Plus Black blog, I commissioned the hugely talented Hannah Ensor of Stickman Communications to create a short series of illustrations intended to represent, with a generous splash of humour, +Black women, all to be based on images and writings from the +Black blog. Hannah has now completed the initial series of illustrations – see +B Illustrated Stickman for the full set – maybe it will be added to at some future date. You might also be interested to note that, I have always been keen to promote and share the work and details of illustrators as I come across them. Click on Illustration Art for more details on those I have featured in the +Black blog. Finally, I have had huge, and ongoing, fun in expressing my own interest in illustration through the wonders of modern technology, being an iPad and stylus. i live with a chronic neurological illness and consequent dexterity problems in my hands and arms. I am unable to hold pens, pencils, pieces of paper, lift things, move freely so had thought all hope of drawing beyond me. If you too have an interest in illustration, I would love to hear from you, about your blog, or your comments on mine so, don’t be a stranger.